We had a terrific and restful Thanksgiving. Neither of our families are close, and we long ago said that we simply don't want to travel on the holidays - there's nothing like waking up in your own bed or cooking in your own kitchen for those special days, especially when the kids are young. In the absence of extended family, somehow over the years, a tradition has grown for inviting in the ex-pat community. It started when we lived in England, as a way to bring together the nearby Americans to enjoy that most American of holidays and traditions. The butcher was always a little confused at our insistence on ordering the largest turkey he could find. But hey: we won the war, so just find me that bird, okay mate? 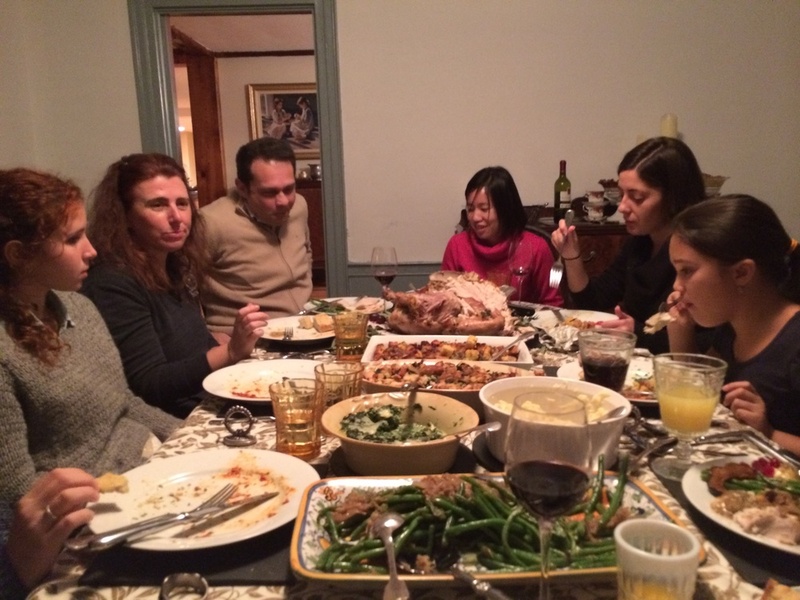 When we moved to Massachusetts, we flipped the tradition a bit, and included more of our non-native friends who hadn't experienced Thanksgiving in all its overabundant glory. This year it was some relatively newly-arrived Italians and a visiting colleague, and a dear old friend of mine from Beijing. And besides, we're going to cook enough to feed a small army one way or the other. So we might as well open our doors. A few days after Thanksgiving, we happily joined one of our nearby neighbors and friends for her traditional post-Thanksgiving Pie Party. Terry is famous for her chickens, and she and her delightful husband we quite literally the first people I met when we moved to town. She is a fantastic cook (and the author of several cook books), and refuses to let anyone bring anything to the pie party except their appetites. I am far too polite too refuse. One of the pies was a savory French recipe for pork pie, made with lard I had rendered from our pigs. It was delicious and I unashamedly went back for a second helping. Now that we're headed into the Christmas season, I've been dreaming about the time off for the holiday, and the opportunity to try a few new meals and dishes. I pulled a dressed, bone-in ham out of our freezer (it was Honeydew's, for those keeping track - our excellent butcher was good about labeling each cut so we can name our meal through the year), and have put it aside for one of my favorite preparations, a cider cure. This is largely based on Hugh Fearnley-Whittingstall's treatment, and guaranteed goodness. Toss the cider, salt and sugar into a stock pot - heat & stir until everything is dissolved. Take off the heat and add the rest of the cure ingredients and let cool. Note that the pink salt is optional. I'll add it in if I'm going to serve the ham to guests, as it keeps the meat the pink color that people expect. I'm lucky enough to have the hard cider that we made & bottled ourselves (and if you're nearby, stop in and I'm happy to give you some). But any hard cider will do, really. I put it all in a large stoneware crock, and set the ham in the cure (you may have to put something on it to weight it and keep it from floating. I have a well-washed, round granite rock from the river that I use). Leave the whole thing in a cool place for 7-8 days to cure. I am blessed with a very cool basement during the winter More for a larger ham. Less for a smaller one. Remove the ham from the cure a couple of days before you want to start cooking it. Pat it dry. Wrap it in a cotton dishtowel and store in the refrigerator. You need to boil the ham before you roast & glaze it. Place it in a large stockpot and cover it with cold water. Add a few of your typical vegies - carrots, onion, maybe some celery. A bit of thyme and parsley and simmer for 4 hours or so. If the stock tastes unpalatably salty, discard most of it (but not the veg), and top up with boiling water. This will help reduce the saltiness of the ham. Remove the ham from the stock and allow to cool a bit. To finish - glaze with your favorite items - we use a combination of brown sugar and either mustard or orange slices held in with cloves. Roast at 350 for about 70-80 minutes, or until the glaze becomes a deliciously dark, bubbly crust. It's not honeybaked or spiral sliced, but I guarantee your guests will like it.